Edith “Edie” Windsor, who sued the government for failing to recognize her marriage to her late spouse, Thea Spyer, asked the U.S. Supreme Court today to hear her challenge to the so-called “Defense of Marriage Act” (DOMA). The petition for certiorari was filed on Windsor’s behalf by her attorneys at Paul, Weiss, Rifkind, Wharton & Garrison LLP, the American Civil Liberties Union, the New York Civil Liberties Union and the Stanford Law School Supreme Court Litigation Clinic. When Spyer died in 2009, she left all of her property to Windsor. Because they were married, Spyer's estate normally would have passed to Edie as her spouse without any estate tax. 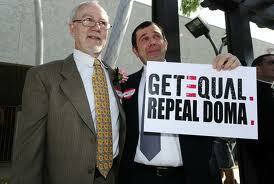 But because of DOMA, Windsor had to pay more than $363,000 in federal estate taxes. Payment of the federal estate tax by a surviving spouse is one of the most significant adverse impacts of DOMA since the amount owed, as was true in this case, is often quite substantial. More on this case can be found at the ACLU website.